Connecting the unconnected is not a simple task especially for a country like India, with different terrains and deep geographical reach. 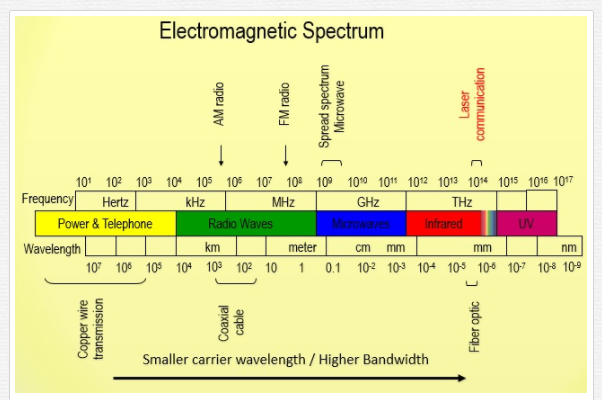 Till now most of the telecom operators have been using licensed Microwave spectrum for connecting areas which has no fibre connectivity. There have been few using Mesh (unlicensed spectrum) for point to point connectivity. 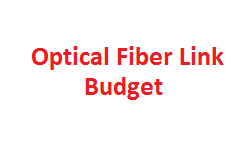 Fiber is always prefered but low ROI, cost of deployment and damage due to developments in a country like India huge. 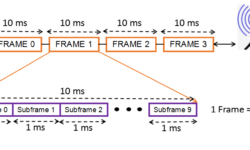 Imagine a technology that could offer Gigabit throughput, which is easy/fast to deploy, doesn’t require licensed spectrum. 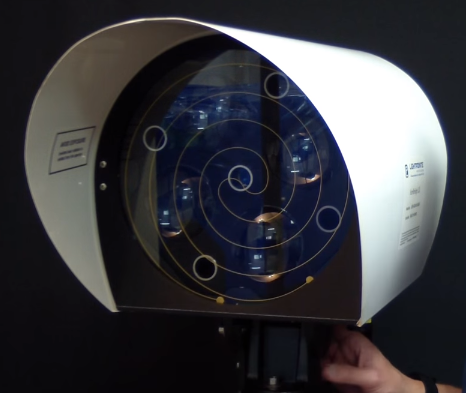 Technology which uses invisible light beams and provides huge bandwidth. Technology which is similar to fibre but is Wireless. 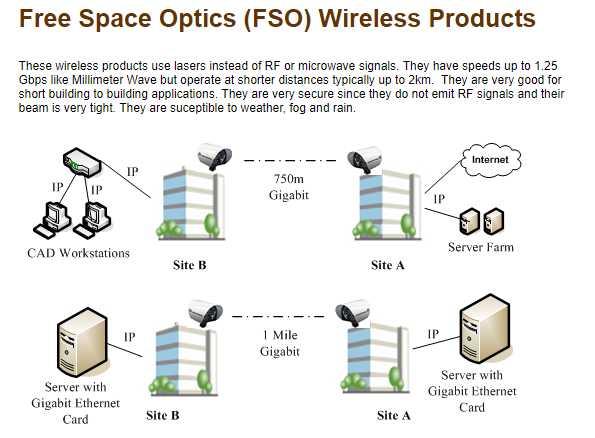 Free space optical communication, FSO is a line-of-sight technology that uses lasers to provide optical bandwidth connections or FSO is an optical communication technique that propagates the light in free space means air, outer space, vacuum, or something similar to wirelessly transmit data for telecommunication and computer networking. 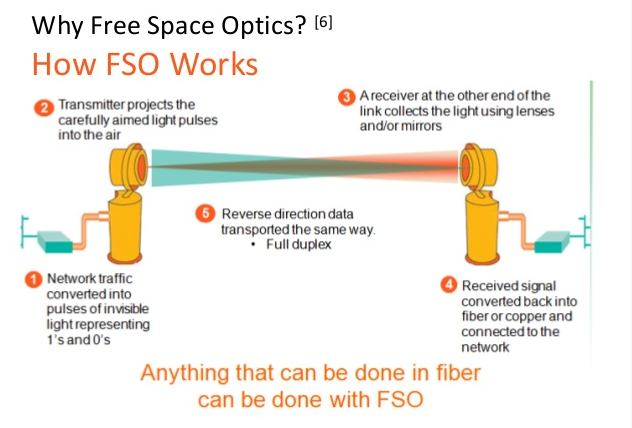 FSO is capable of up to 2.5 to 10 Gbps of data, voice and video communications through the air, allowing optical connectivity without requiring a fibre-optic cable or securing spectrum licenses. 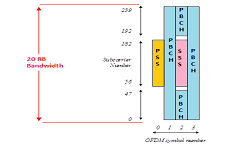 Operate between the 780 – 1600 nm wavelengths bands and use O/E and E/O converters. Alphabet is adopting laser-beaming boxes (FSOC) in place of Loon balloons for its latest internet-delivery partnership with Govt of Andhra Pradesh, India. The plan is to deploy light-beaming links, kilometres apart on roofs and to plug-in network access gaps between cell towers and WiFi hotspots under Fibernet/ BharatNet connectivity scheme. 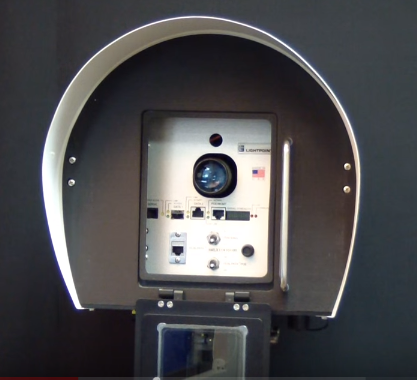 Google has been using this technology for connectivity between Loons and using this for connectivity on the ground could enable another wireless backhaul technology. There are lot of articles online for more on this partnership, in this blog we try to introduce basic and information about FSOC. 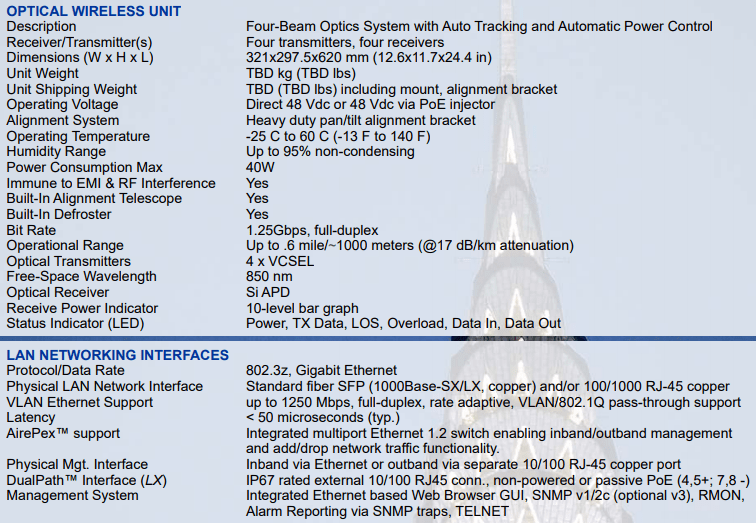 This unlicensed spectrum could be used for IoT, Smart cities, last mile connectivity and connectivity instead of Fiber. 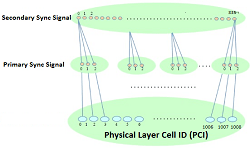 Like other telecom connectivity links, FSOC devices also have evolved (using MIMO) to support high speeds and reliable network. The environmental effects can be reduced with multiple streams and throughput can be increased during normal operations. 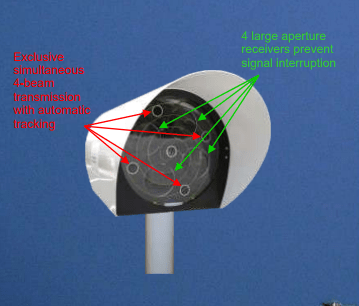 During our research, we came across multiple organisations making these optical devices for the communication backhaul.